Early Stratovarius music walks a fine line between the incompetence of a local pub band and the brilliance of Yngwie Malmsteen. On Fright Night, the debut from one of Finland's earlier metal success stories, the music often threatens to fall into the abyss of hopelessness, particularly with Timo Tolkki's tortured vocals. But then magical if brief guitar segments, again courtesy of Tolkki, arrive to save the day and land the album in respectable territory. 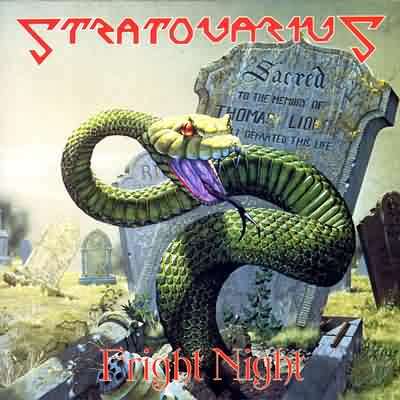 Fright Night provides a promising foundation, but leaves the definite impression that Stratovarius have a lot of maturing to go through. Better songwriting, better vocals, and an independent producer would go a long way to polishing the band's sound. The short sharp length of the album, at eight meaningful tracks, is appreciated. Three of the songs using "Night" in the title is an example of the growing-up that is needed. Opener Future Shock and title track Fright Night demonstrate the best of the band and the ability to pull together complex songs with some powerful guitar-driven passages. But even these two tracks suffer some dodgy patches and vocals screaming for help. The rest of the material alternates between amateur city with brief glimpses of excellence that point to potential yet to be fulfilled; but there is enough talent, drive and ambition on display for Stratovarius to receive the benefit of the doubt, if not yet accolades.